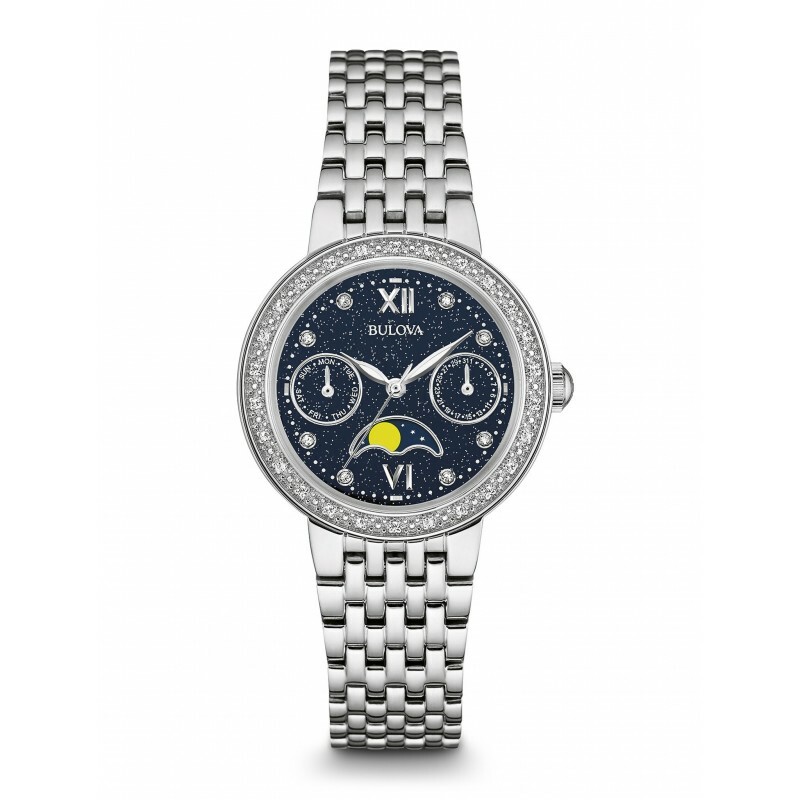 Hey everyone, today we’re going to be taking a look at the 15 best Bulova watches for women. 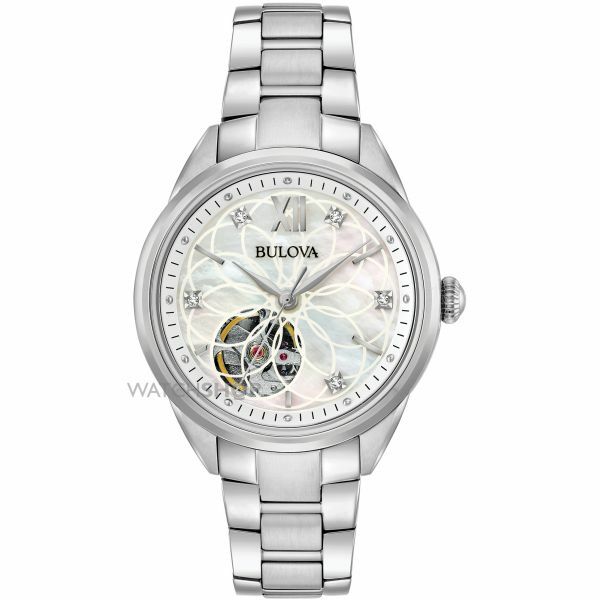 I don’t often get a chance to feature women’s watches but Bulova have some stunning designs available at the moment that are really popular, so I thought I’d showcase some of the best today. The list if roughly in order of price at the time of writing. 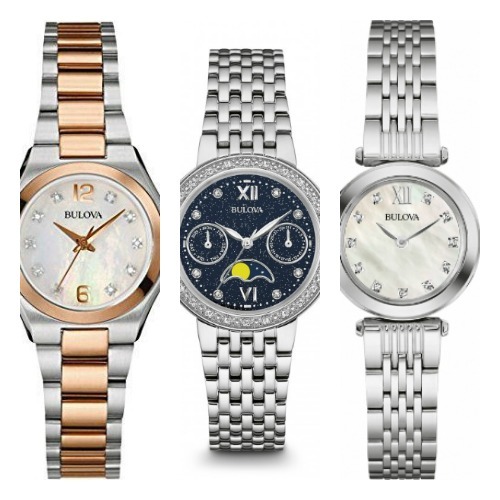 At the top, you’ll find the more affordable women’s Bulova watches. And towards the bottom, you’ll find some of the more expensive Bulova watches for women. I hope you enjoy taking a look at this list today, let me know your favourite in the comments section below. 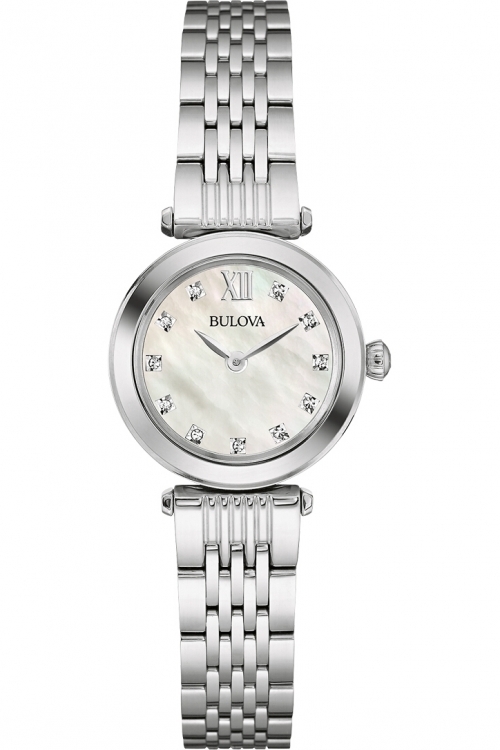 First up in our top 15 Bulova women’s watches is the 96S159. 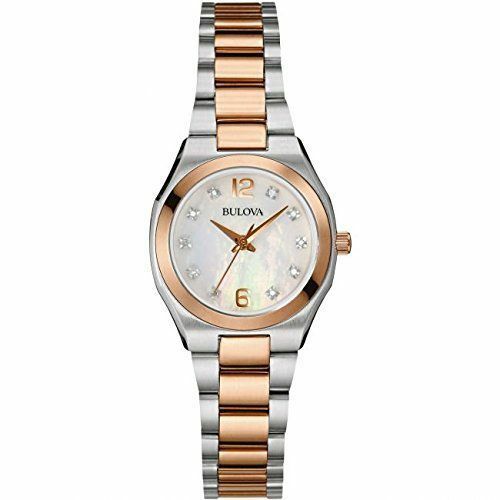 This slim line Bulova Diamond Gallery watch features four hand set diamonds that compliment the Mother of Pearl dial beautifully. The watch is high quality with a sapphire crystal glass giving it excellent scratch resistance. It’s powered by a Japanese Miyota quartz movement and has a 30m water resistance rating. Overall a great start for today’s list. 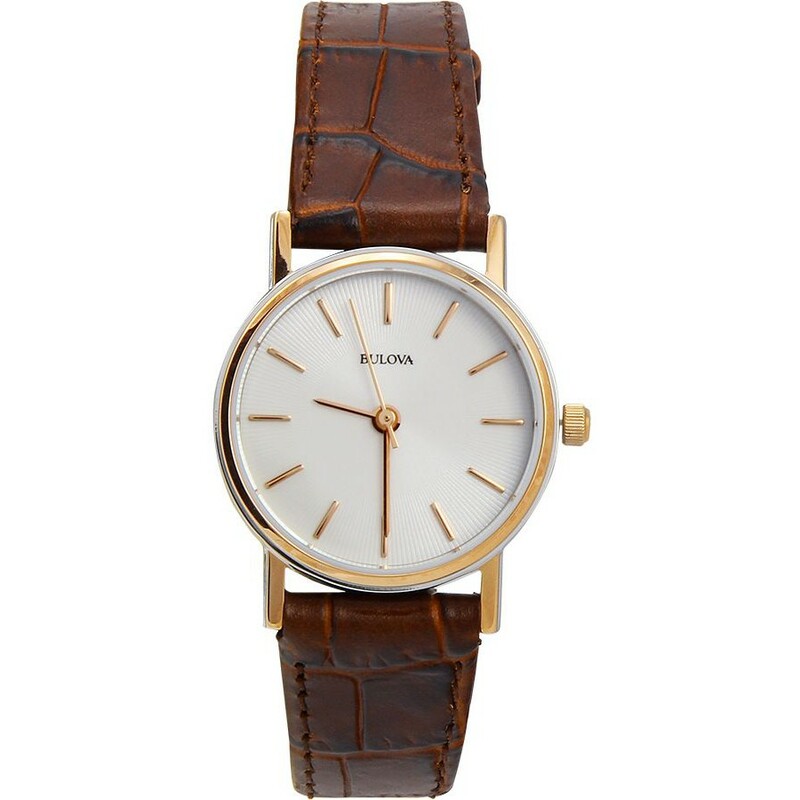 Next up for our Bulova Women’s watches is this nice leather strapped dress style timepiece. It’s part of their classic collection that’s crafted with a simplistic style in mind. The casing has a PVD rose gold plating as does the detailings on the watch such as the hands and hour markers. This gives the whole watch a very nice finish. The watch features a Japanese Miyota quartz movement as well as a mineral crystal glass and 30m water resistance rating. 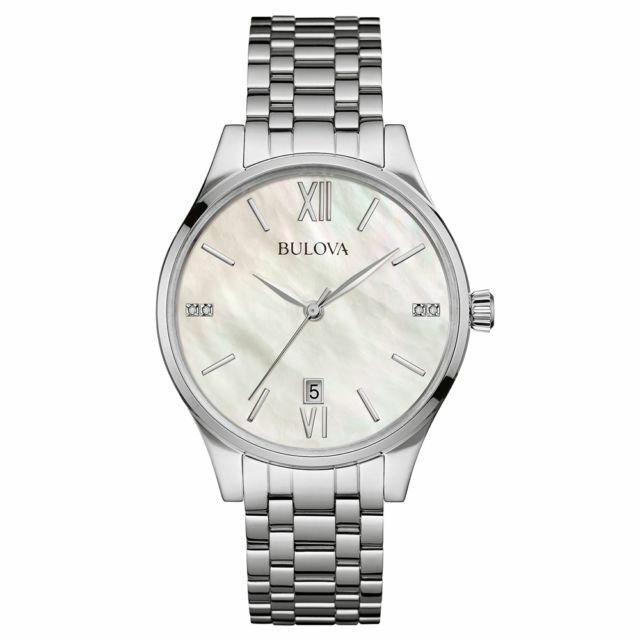 This is another ladies Bulova watch that features a Mother of Pearl dial. The dial also features four hand set diamonds like the first watch that was on show. You’ll notice it’s slightly larger with a bigger dial and wider strap as well. There’s a small date display on show that can come in handy if need be. The watch is powered by a Japanese Miyota quartz movement, has a sapphire crystal glass, and a 30m water resistance rating. 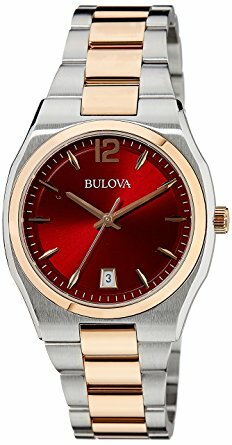 This is another popular women’s Bulova watch with a fantastic burgundy dial. 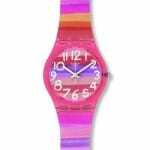 If you like a bit of colour with your timepiece then this could be ideal for you. This dial compliments the two tone finish of the watch blending really well with the rose gold on the bezel and strap. The watch is fitted with a Japanese Miyota quartz movement that features a date display. Other features of the watch include a mineral crystal glass and a 30m water resistance rating. 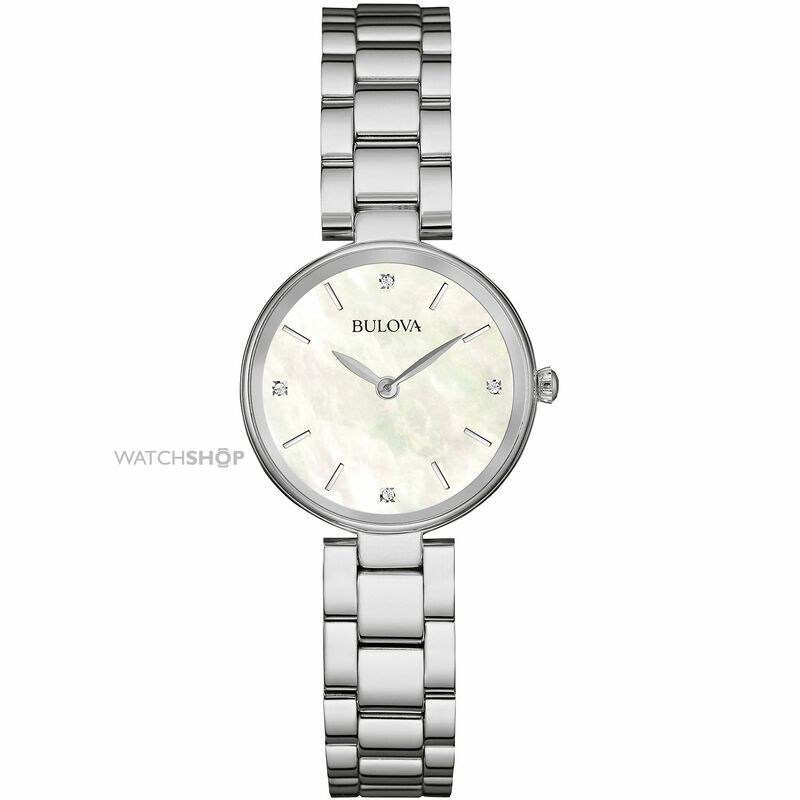 Something a little different this time round from Bulova is this delicate looking timepiece. I think the rose gold PVD finish looks stunning, the detailing on the dial also looks great. It’s a dress style watch with a small 20mm casing diameter that makes it quite dainty. This watch runs on a Japanese Miyota quartz movement, a mineral crystal glass, and a 30m water resistance rating. 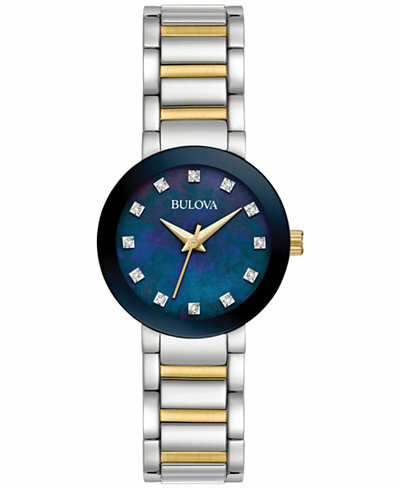 The 6th ladies Bulova watch to be featured is this beautiful Diamond Gallary watch. This watch features 10 hand set diamonds on the dial as hour markers, with the Mother of Pearl dial this looks fantastic. This Bulova watch has a sapphire crystal glass, Japanese Miyota quartz movement, and a 30m water resistance rating. This is another high end Bulova watch. It features 11 hand set diamonds around the dial marking the hours, the 12 o’clock marker is displayed as a Roman numeral though. The Mother of Pearl dial looks brilliant as always, I just love the colours you get with these. As you’d expect from Bulova’s higher end watches, this model features a sapphire crystal glass, Japanese Miyota movement, and a 30m water resistance rating. We’re starting to get into the more expensive ladies Bulova watches now. This stunning Diamond gallery watch features 12 hand set diamonds marking the hours on the dial. The dial itself has a lovely effect on it, and the gold hands blend beautifully. The watch also features a Japanese Miyota quartz movement, sapphire crystal glass, and a 30m water resistance rating. 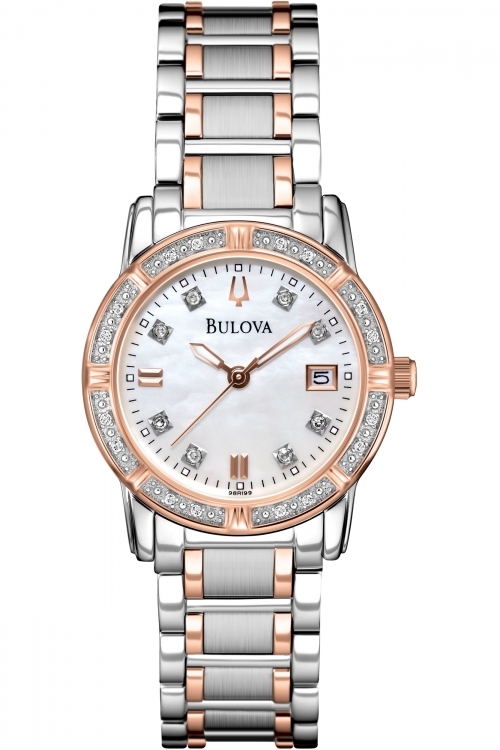 Something a little more subtle this time round from Bulova’s diamond range. This model features just one hand set diamond that sits at the 12 o’clock position. The dial itself is quite small measuring 22mm in diameter. 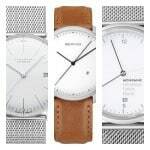 If you like the thinner bangle style straps this may well be ideal for you. The watch features a Japanese Miyota quartz movement, mineral crystal glass, and a 30m water resistance rating. 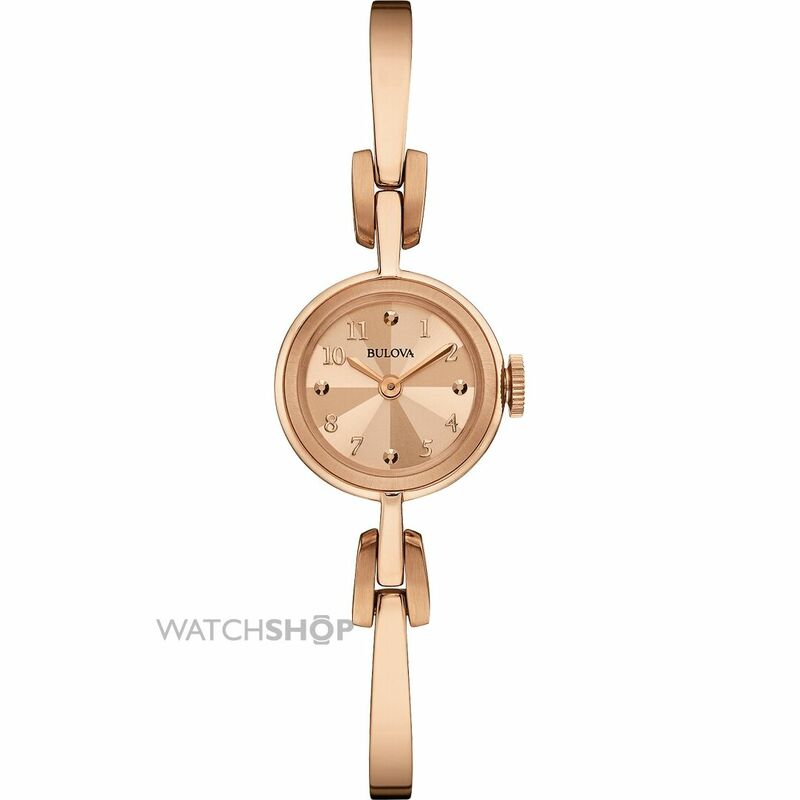 This is one of the best selling women’s Bulova watches. It’s from the Diamond Gallery collection and features 19 hand set genuine diamonds on the dial and bezel. It’s the first in our list to feature a chronograph movement too. Overall a very stunning watch with its Mother of Pearl dial and beautiful display. The watch features a Japanese Miyota movement and a 30m water resistance rating. This next Bulova timepiece ups it a bit in terms of diamonds. It features 24 individually hand set diamonds around the bezel and dial. The rose gold and stainless steel two tone finish looks amazing, I also like the detailing on the strap of brushed and polished finishing. The Highbridge features a Japanese Miyota quartz movement, Mother of Pearl dial, mineral crystal glass, and a 30m water resistance rating. This has to be one of my favourite ladies Bulova watches. I love this dial design with the sparkly blue sandstone finish and the detailing is fantastic. There’s hand set genuine diamonds marking out 10 of the hour positions on the dial too. This Bulova watch also features a push-button deployment style bracelet, Japanese Miyota Quartz movement, sapphire crystal glass, and a 30m water resistance rating. Well worth considering. 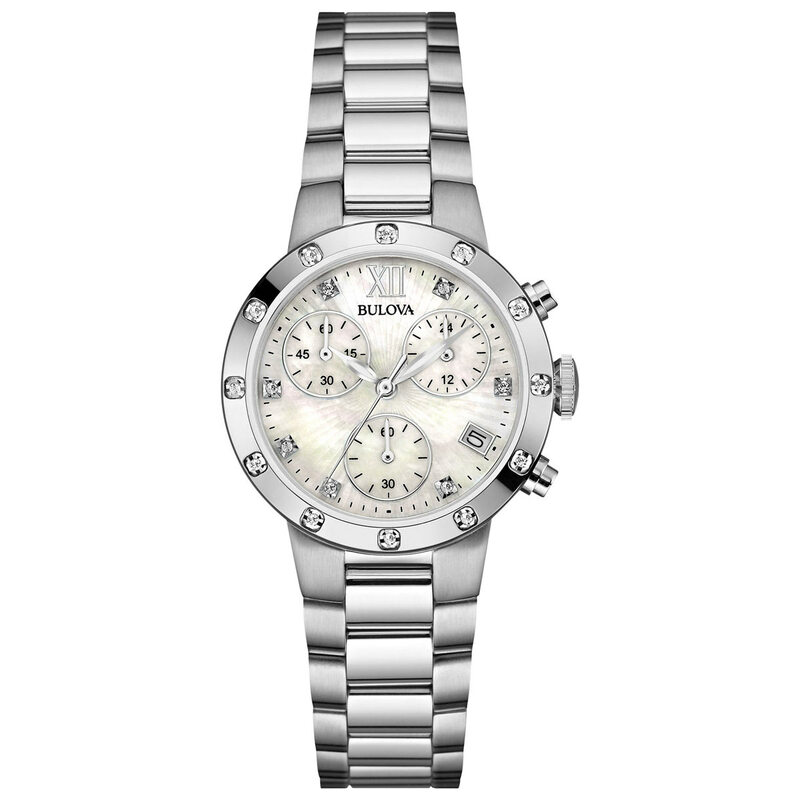 This is another best seller for Bulova from their popular Diamond Gallery collection. It’s a ladies two-tone steel and gold plate watch that features a chronograph display on a beautiful Mother of Pearl dial. It’s a colour variant of watch number 10 and features the same 19 genuine hand set diamonds on the bezel and dial. The watch features a Japanese Miyota movement and a 30m water resistance rating. It’s pretty easy to see why this one has been so popular in my opinion. Again another top model is a Bulova ladies diamond watch. These have proved very popular in today’s list, they do look very nice to be fair. This is a very high end model and features 24 hand set genuine diamonds on the bezel and dial. The dial itself is Mother of Pearl and gives off some great colours. The watch runs on a Japanese Miyota movement, has a sapphire crystal glass, and a 30m water resistance rating. 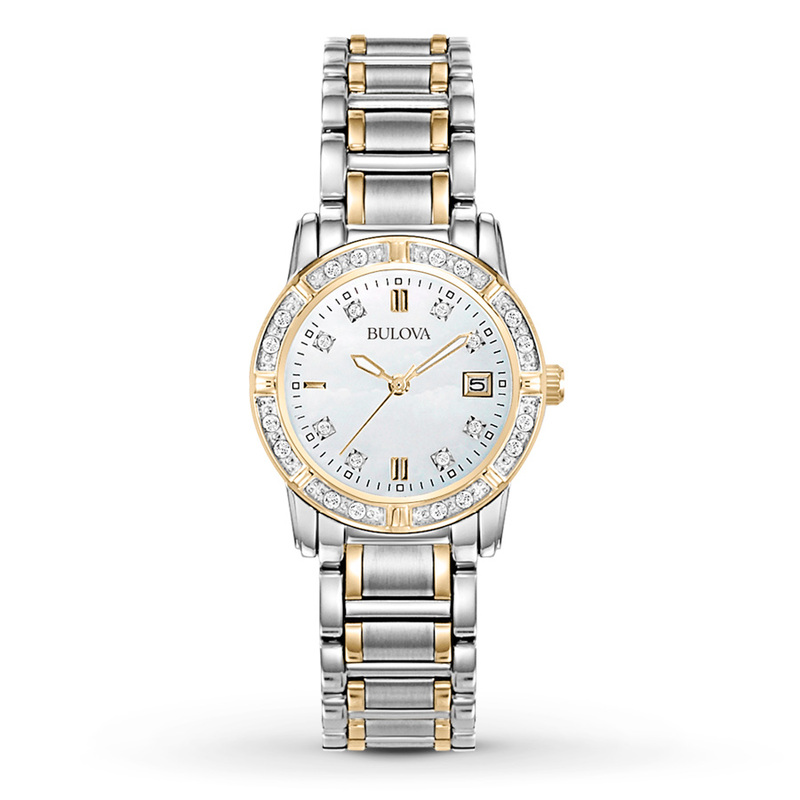 Last on our list of the top Bulova women’s watches is this really interesting automatic timepiece. It’s the only automatic Bulova watch on today’s list and also one of the most expensive at the time of writing. But I have to see the dial design is brilliant. I love this floral design on the Mother of Pearl dial with the genuine diamonds in place of some of the hour markers. I think the exposed part of the movement is a great touch too, adds something a little different to the overall design. The watch features an automatic movement, sapphire crystal glass, and a 30m water resistance rating. As always I’d like to say a big thank you for reading today’s list. Why not check out my best Michael Kors watches for women next. 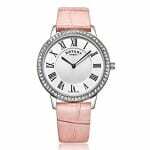 So what was your favourite Bulova women’s watch in today’s list? Mine have to be 12, I just love that dial design.